The DevelopHER Awards is an annual not for profit awards ceremony which recognises women who work within the technology sector in East Anglia. Back in 2015 they ran an event in Norwich in which over 150 people attended and they received 130 nominations across 11 different categories. Following on from this, 2016 saw the event grow and the event eventually moved to Ipswich and had over 200 attendees. The DevelopHER Awards aim to raise the profile of women working in technology in East Anglia, creating role models to inspire the next generation to become developers, technicians, project managers, testers and digital experts. 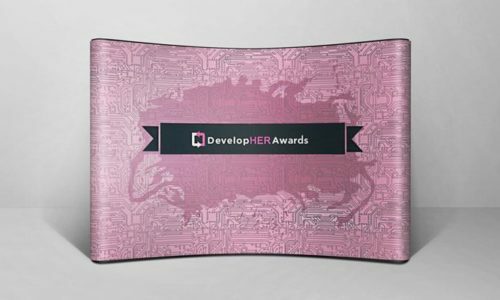 The DevelopHER Awards contacted us as they were looking for a stretch curved stand which will be on the stage during the awards ceremony and would also be used to capture photographs of award winners at the event. The stand had to be made from a stretch fabric which also came with a stand so that it could be used perfectly at their event. The stand measured 3000 x 2280mm so the printing technique used had to make sure that the design of the backdrop was clear and all the graphics were sharp and crisp. In order to achieve this we recommended using a digital printing technique which would allow the design of the artwork to be replicated accurately and printed perfectly onto the backdrop. The digital printing technique offers superb full colour printing capabilities and it is ideal for long or short runs. The backdrop was printed and delivered and delivered to the client and they were incredibly happy with the final printed product and it was used during the recent DevelopHER Awards and can be seen in the above images.